Home DestinationsEurope What is the cost of a Gondola ride in Venice? A gondola ride through the beautiful canals of the Venetian Lagoon is often the highlight of a trip to Venice. Gondolas are flat-bottomed, narrow rowing boats unique to Venice that were once predominantly used by the city’s upper class. For hundreds of years gondolas were the main means of transportation throughout the city. The introduction of motorboats means gondolas are now less practical, but they are still a very popular attraction for tourists. Although the cost of a gondola ride in Venice is quite high, it is a truly unique way to explore the canals of this floating city. 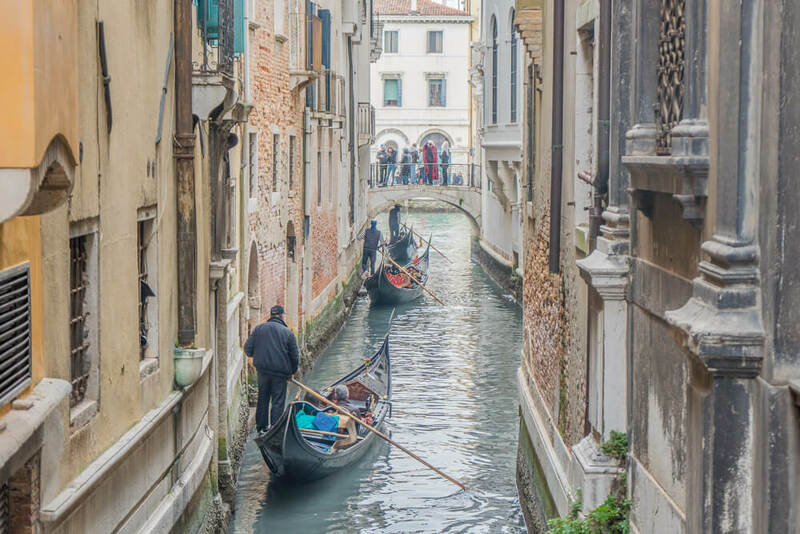 If you’re trying to keep costs down, fortunately there are cheaper alternatives for budget gondola rides for as little as €2, as well as other ways to get around Venice. This article seeks to answer 2 questions: 1. What is the cost of a gondola ride in Venice? and 2. What are the alternatives to gondolas? Looking for an itinerary for your trip? 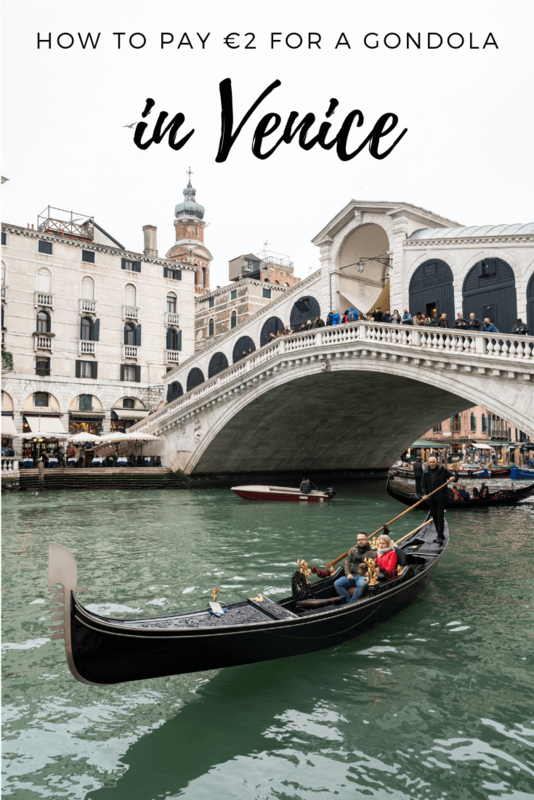 Check out our guide to the top things to do in Venice in 2 days! The city of Venice set official rates for gondola rides, with prices starting at €80 for a 40 minute ride as of 2019. Rides can be increased in length, with an extra 20 minutes costing €40. After 7pm the cost of a gondola ride in Venice increases to €100 for 40 minutes, with an extra 20 minutes costing €50. The advantage of taking a gondola at night is that the canals tend to be less busy as most people opt for the cheaper daytime rides. Up to 6 people can share a gondola, which means a daytime gondola ride in Venice split between 6 people would have a price of just over €13 per person. The cost of a ride should be the same regardless of whether it is for 1 person or 6 people. The idea of a gondola ride and serenade in Venice is something you may have seen in movies. Although it is possible to arrange, if you do want a singing gondolier then it will come at a price. 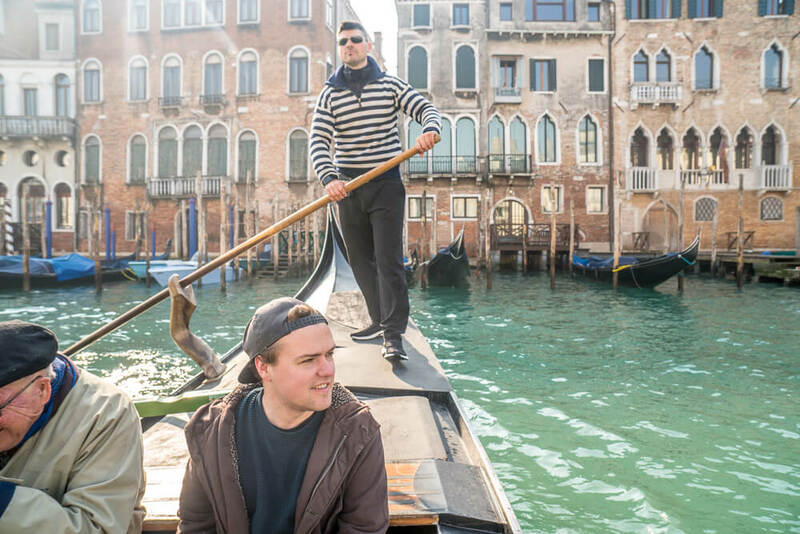 Gondoliers themselves don’t sing, so you have to pay for an accordionist and singer to accompany you on your trip. This will generally add an additional cost of at least €80 on top of the price of the gondola ride, if not more. Although there are official rates for gondolas in Venice, if there is high demand then gondoliers may charge more. Unfortunately there isn’t too much you can do about this as there will normally be someone willing to match their price. Make sure to always agree your price before your trip as sometimes gondoliers may try to charge more if they think they can get away with it. You should also make sure that your ride lasts the right amount of time as they may try to finish early in order to make more money that way. 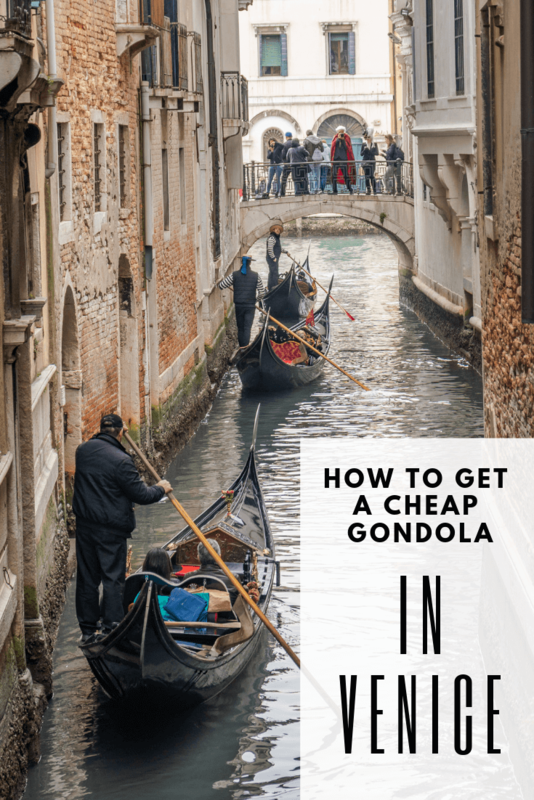 It’s sometimes possible to negotiate a slightly cheaper price for a gondola ride in Venice, but generally the gondoliers aren’t willing to nudge on their price. Even if you’re only asking for a small discount the gondoliers know that other tourists will pay full price and so they will lose money by agreeing to a discounted rate. Gondolas are easy to find all around Venice so it’s not essential to book one in advance. 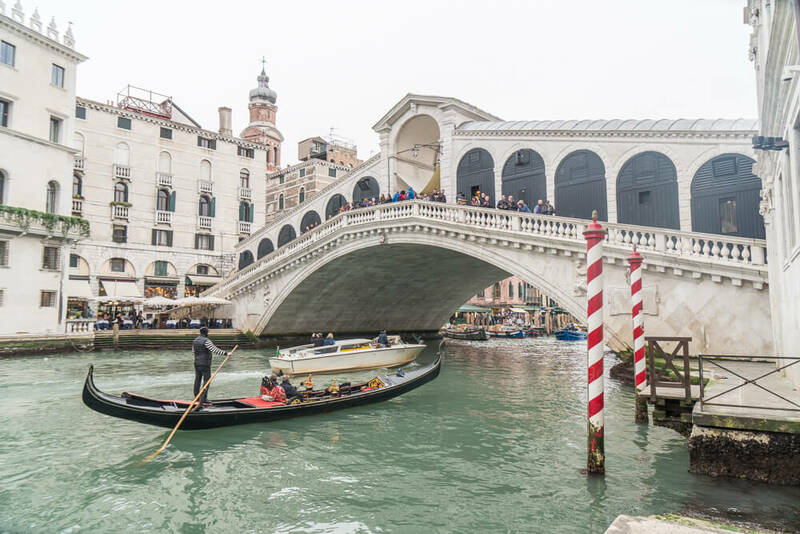 Gondolas can be found at designated gondola stations and popular tourist attractions such as the Rialto bridge and the Doge’s Palace. You can also find gondolas along some of Venice’s smaller and less busy canals. Simply turn up and you should be able to arrange your ride easily. Wherever you arrange your gondola the prices should be the same. If you wish to negotiate a cheaper price, your best chance of success is with the gondoliers on side streets. When arranging your gondola ride it’s a good idea to consider where you want to start from. If you start from a popular spot such as the Rialto bridge then it’s likely there will be a lots of gondolas passing through. This may ruin the atmosphere for you a bit if having lots of other people around bothers you. It’s also important to consider if there is anywhere in particular you’d like to see during your gondola ride. If you’re happy to go with the flow let your gondolier decide but if not you can ask to be taken down some of the smaller, less busy canals. By asking your gondolier to take you along some of the smaller canals you are likely to have a more peaceful ride. Unfortunately there is no way to determine the best gondola route in Venice, as it all depends on how busy the canals are on any given day! If you do want to book a gondola in advance you can do so via Get Your Guide. 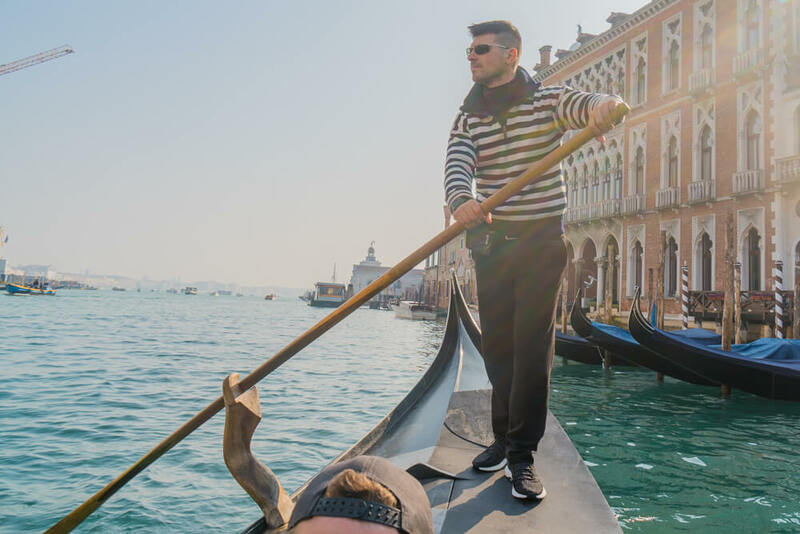 Private gondola rides will end up costing slightly more than if you just arrange one on the day, but you will be able to reserve a specific time slot to suit your needs. Click here to book a 30-minute private gondola ride in Venice! Alternatively, if you’re looking to save some money you can take a shared gondola ride. These shared rides allow up to 6 people at once and cost €32 per person. If you’re in a group it makes sense to just split the cost of your own gondola, but if you’re a solo traveller or travelling as a pair then booking a shared gondola ride is a good way to save some money! Click here to book a 30-minute shared gondola ride for your trip to Venice! If you’re looking for a budget gondola ride in Venice then a traghetto is perfect for you. Traghetti have been used in Venice for hundreds of years as a means of ferrying passengers from one side of the Grand Canal to the other. The boats aren’t quite as lavish as the gondolas but other than that they are very similar in appearance. Traghetto rides are much shorter than gondola rides, generally only lasting a minute or two – if that! A traghetto ride in Venice costs just €2 per person for tourists or 70 cents for locals. 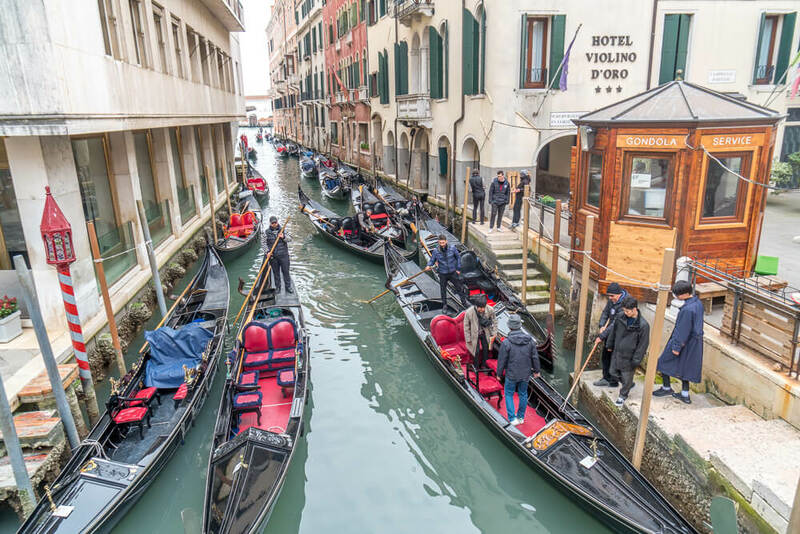 Many locals still use this method of crossing the canal, so taking a traghetto is a great way to save money whilst having an authentic Venetian experience. It also gives you the chance to get some of the same views you would get if you paid for a gondola trip. Traghetto rides are generally shared between a number of people wanting to cross at the same time. By taking a traghetto we were able to get a cheap gondola ride for €2 each, saving us €76 off the official Venice gondola rates. There are 7 traghetto routes in Venice if you want to take one during your stay. To find a traghetto look for the large black signs along the Grand Canal or for street signs that say traghetto on them. Unfortunately, not all routes are open every day, but generally there are at least one or two open on any given day. Two of the most reliable traghetto routes are from Pescaria (Rialto fish market) to Santa Sofia and from San Toma to Sant’Angelo, so if you’re hoping to take a ride we recommend heading to any of those spots. Even if you don’t necessarily need to cross the river, a traghetto is a great way to have a quick gondola experience in Venice without having to pay full price. One of the most convenient ways to get around Venice is using the public water bus service known as the vaporetto. The water buses are the only means of public transport in Venice and are a very practical way of getting around if you don’t want to walk everywhere. There are a number of different vaporetto routes around the city and surrounding areas. Vaporetto route 1 is particularly useful as it operates along the Grand Canal. 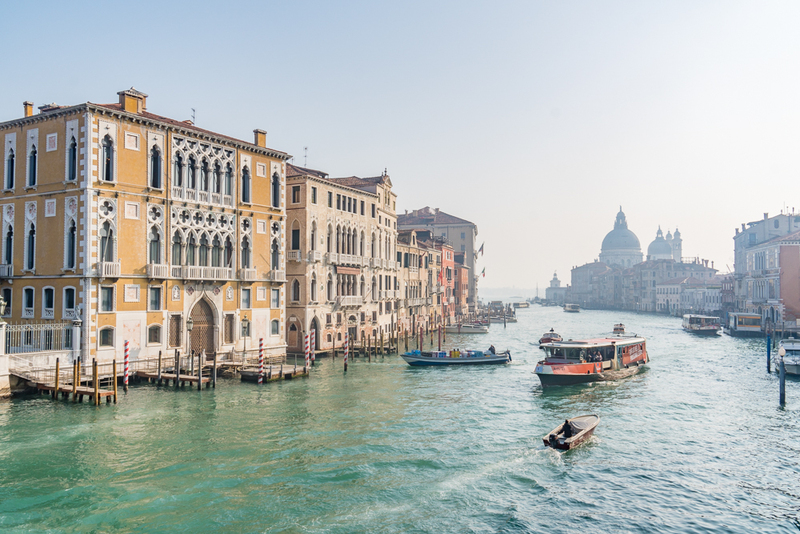 It runs between Piazzale Roma and Lido making multiple stops along the Grand Canal, including at San Marco – the closest stop to the famous St. Mark’s Square. Route 2 also goes along the canal, making both routes perfect for getting views of Venice from the Grand Canal. If you sit at the very front or back of the boat on these routes you will be in the best position for views of the Rialto bridge. The Vaporetto is also very useful for exploring the areas of the Venetian lagoon outside Venice, such as Murano, Giudecca and the colourful island of Burano. It’s also well worth taking the vaporetto to San Giorgio Maggiore for wonderful views of Venice from the top of the church’s bell tower. 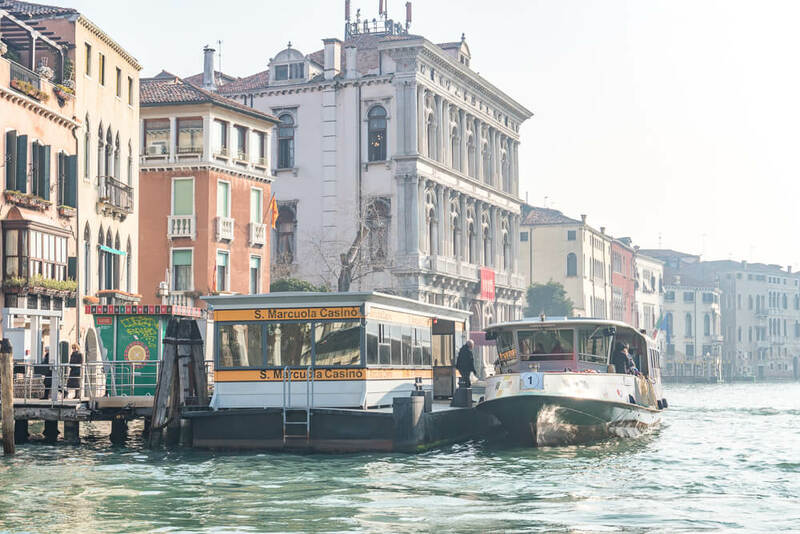 Alternatively it costs just €7.50 for a single trip of up to 75 minutes, but if you plan to use the vaporetto multiple times then it is likely to work out cheaper buying a day or multi-day ticket. For anyone between the ages of 6 and 29 it’s possible to get an even cheaper multi-day ticket, with 3 days costing just €28 in total. This can be done by purchasing a Rolling Venice card for €6 alongside a 3 day ticket for the reduced rate of €22. We strongly recommend doing this if you’re eligible and visiting Venice for a few days as it’s great value for money considering how useful the water buses are for getting around. As the water buses are a means of public transport they can get quite busy, especially during peak times. Although the boats do have seats it isn’t always possible to get one. Even so, the vaporetto is a cheaper and more practical alternative to travelling around Venice if you don’t want to pay for a gondola. Click here for up-to-date information on vaporetto services on the operator’s website! If money is no object then water taxis are also available in Venice but are generally quite expensive. Prices do vary but a relatively short water taxi trip within the historic centre of Venice can cost around €40-70. Travelling by water taxi is quicker than public transportation, which can make it worthwhile if you have the money. Water taxis can accommodate up to 10 people at once, so if you’re travelling in a large group and splitting the fare the cost is more reasonable. If you’re planning a trip to Venice then it’s important to book your hotel or accommodation in advance. It’s an extremely popular city to visit, which means the best hotels are often fully booked. By planning ahead you’ll have a better selection of places to stay and so can make sure you find the best accommodation for your budget. We recommend using Agoda to find accommodation as they have a great selection of different hotels and properties in Venice. They regularly have good discounts, so you might be able to save some money too! Click here to check out the best places to stay in Venice on Agoda! It can also be worth booking any tours or activities you want to do in advance to make sure you can fit everything you want into your trip. We recommend using Get Your Guide as they have a great selection of different private and group tours/activities available to book in Venice. Click here to check out the great tours and activities available in Venice on Get Your Guide! Like this guide to the cost of a gondola ride in Venice? Pin it! Very useful article. We are going to Venice in the Summer so will be sure to try a traghetto, and its a bargain for that price. Thank you! It’s definitely a useful way to save money if you don’t want to pay for a gondola!